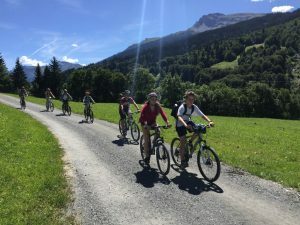 We arrived in Klosters late on Friday afternoon and after checking in at the hostel we went straight to Obrist to rent bikes before he closed. A brief change of clothes later we found ourselves heading up to Sardasca for an evening cycle ride. The three children and I had regular mountain bikes but Sos, who is arguably a more reluctant cyclist, opted for an e-bike. As we made our way up the first hill to Monbiel it was clear that Sos had made a good decision as she cruised up ahead of the rest of us. We caught our breath at the Monbiel car park and headed along the pretty Garfuin valley. The hill at the end of the valley is always a challenge and we were determined to make it without stopping (which of course Sos did much more easily than the rest of us!). The weather was overcast and a nice temperature for cycling and we were rewarded with the welcome sight of the “syrop bar” once we arrived at Sardasca. For those not in the know, the water fountain here is amply stocked with beer and various home made syrops together with an honesty box. Sam, Wilf and India proceeded to try the lot (not the beer though!). Given the chill in the air we didn’t linger long and then we had our real reward, downhill all the way back to Klosters. 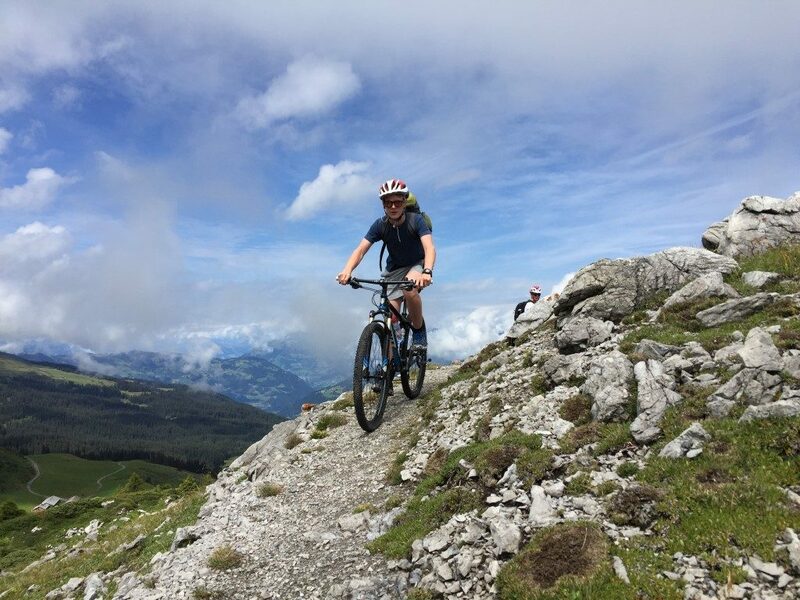 On Saturday we decided to try something new and took the bikes to the top of the Gotschna with the plan of cycling down to Wolfgang for lunch and then continuing down the hill to Klosters. The weather was gorgeous and the mountains can rarely have looked more stunning. 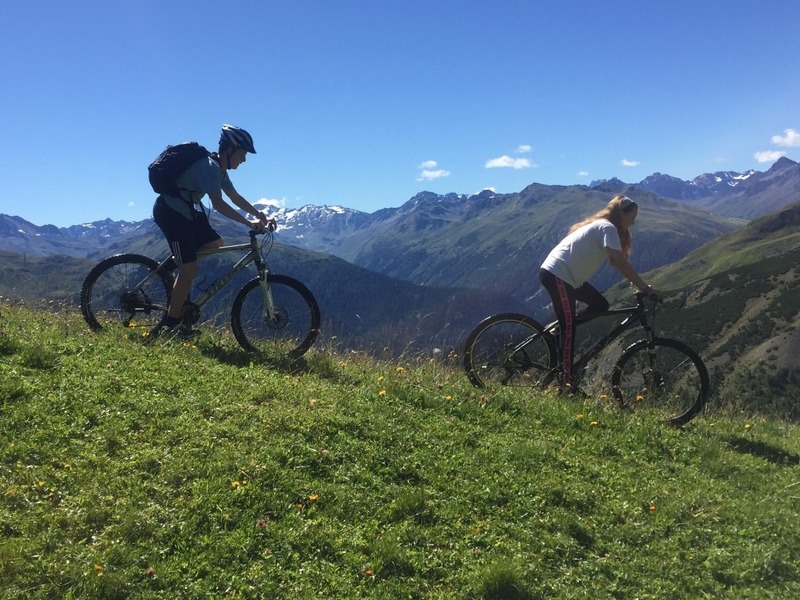 We cycled across to the Parsennhutte and had a drink at the Munga Hutta which is run by Jorg and Anja who also manage the Hotel Rustico. Much to the delight of the junior team their husky (Eis) was there too, resulting in considerable pressure for us to get a husky! Not long after a descent started I was blighted with a front wheel puncture and of course I had not thought to bring a puncture repair kit! While the others were able to freewheel down the mountain I was resigned to a nice walk. Thankfully the hotel at Wolfgang markets itself in the summer as a cycling hotel and so they had all the right kit to allow me to sort it all out over lunch. 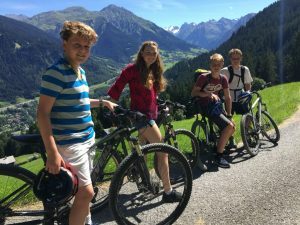 That was just as well as we got a bit more adventurous after lunch and attempted the single width track down to Klosters. This was definitely a challenge as we are not experienced mountain bikers! About half way Sos, India and Wilf reverted to the main road to enjoy some smooth tarmac, but Sam and I persevered and although it was not elegant we eventually made is to Selfranga. In for a penny, in for a pound, we headed up the track to Ruti (a first for me) which was very pretty and bathed in sunshine. It was then downhill all the way back followed by a relaxing rest of the afternoon by the Klosters pool. On Sunday we were joined by my sister, Santa, and her two children, Lily and Sasha. We divided into two groups with the more energetic heading up towards Scheifer so we could enjoy the long descent down to Serneus, which definitely got the thumbs up. We met up with the others at the Restaurant Gotschna and then continued down the valley to Kublis. It was a lovely ride, nearly all downhill and for the most part nice and wide. The weather again was gorgeous and the route took us next to the river Landquart and past charming little chalets and cow sheds. A relaxing lunch was had at Kublis from where most of the group took the train back up the hill to Klosters. Santa, Sam and I felt we had a bit of lunch to work off so we decided to cycle. All I can say is the last hill up to Klosters Dorf is a brute! Sadly we were only hiring the bikes for the weekend and we returned them first thing on Monday morning. However not before a final pre breakfast jaunt to Sardasca as the sun was coming up over the mountains. Notes: we hired bikes from Obrist on Doggilochstrasse although they are also available to rent at Bardill Sport (next to the Gotschna) and Andrist. Cycle maps are available at the tourist office and are marked blue, red and black to indicate the difficulty of the routes. For us we were definitely most comfortable on the blue ones!